This bar is best seen from the square outside it. This square is on the end of the trail before the bar so look at section13 of the trail if you wish to find out more about it. The square is separated from the bar by a busy road; the traffic lights can help you cross safely but they will also test your patience. This view of the bar [and the red roofs and the Minster beyond] is very popular. Looking from here you can see the oldest visible part of the bar –the round Norman arch [about 900 years old] and the medieval fort above it [about700 years old] with its cross-shaped slits for arrows to be shot from. The remains of a Roman gateway here are under the ground. Victorians repaired the bar [about 130 years ago], replaced the 3 stone figures and added the steps up to it. The trail goes up these steps, through the heavy, anti-pigeon gate and into the room above the arch. A portcullis is on your left and a 19th century wall is on your right –the original builders had larger windows here, they didn’t expect attacks from the York side of the bar! The square it is best to see Bootham Bar from is called Exhibition Square, other views from it and off-trail extensions from it are described as part of section13 of the trail. The best view of the bar is probably from immediately below the statue, to its right. The statue is of a Victorian painter called William Etty and a model of the bar is behind his knee because he campaigned to protect the Walls and bars. The painted stone shields on the front of the bar are modern replacements for ones that had become weathered. They show a royal coat of arms and York’s coat of arms [gold lions on a red cross of St. George]. The 3 statues on top of the bar are by a Victorian mason who had his workshop beside the bar, they show a medieval Lord Mayor, knight and mason, and replaced earlier statues. 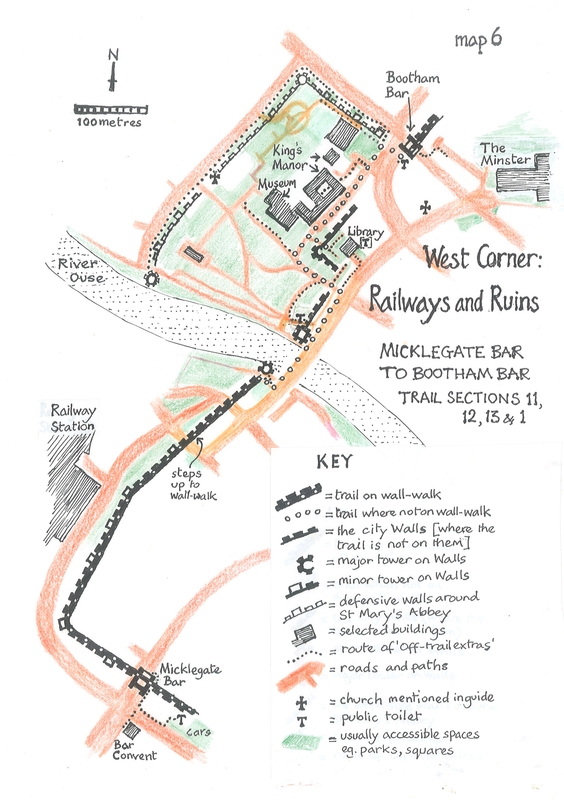 There are information boards about the bar and the gateway of the Roman fort that is underground here. The room at the top of the steps shows obvious signs of a floor above it [below the present ceiling level]. From the top of the steps going up to the bar: look down the steps then up and a little to the right to see where the Walls start again. It is about 100 metres away, on the other side of the road, that York’s corporation built through the Walls in the 1830s. 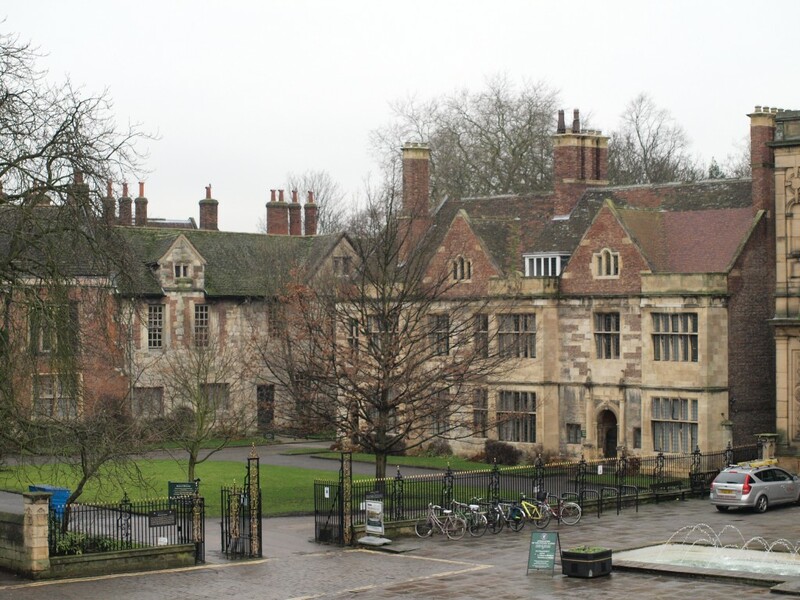 To the right of this is the King’s Manor, built around the house of the abbot of St Mary’s Abbey [confiscated by King HenryVIII in 1539], then the statue of William Etty in the middle of the square and, on the right of the square, the postern tower [and defensive walls] of St Mary’s Abbey. Etty is shown looking at the bar because he was a leader in the fight to save the Walls from destruction by the corporation and for use as a public path. 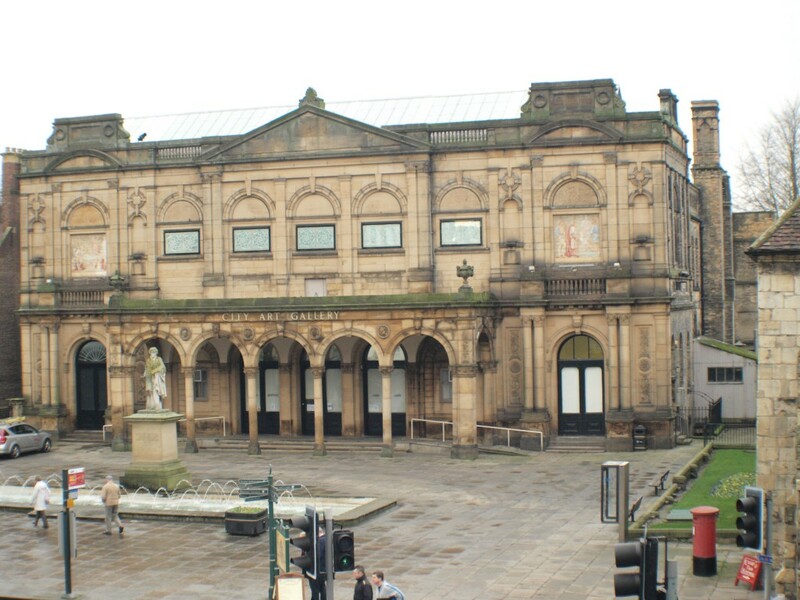 He is shown painting as he was a professional artist [he did paint the Walls but is better known for his nudes], behind him is York’s main Art Gallery. 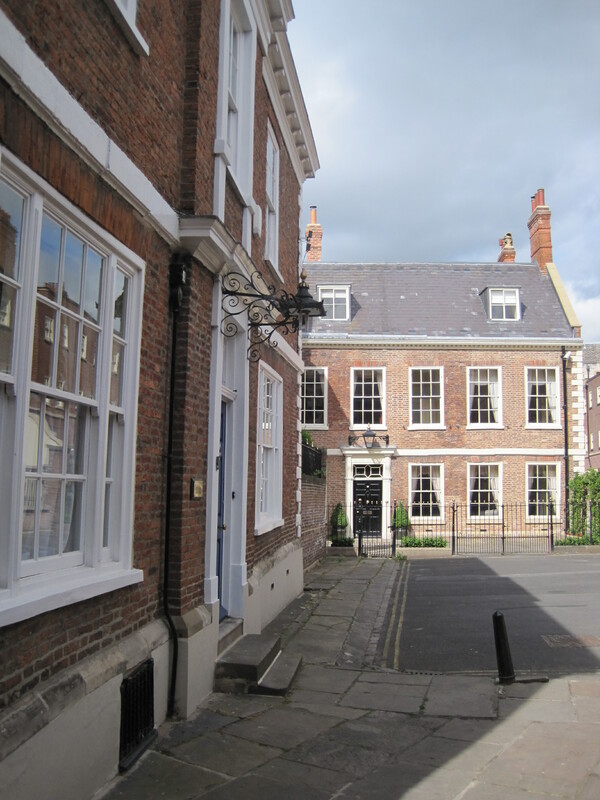 From the 19th century slit windows: you can look into York along Petergate, one of York’s picturesque, mostly car-free streets; this street follows the line of one of the 2 main roads running through the Roman Fort, it is not quite as straight a line as it was 19 centuries ago. 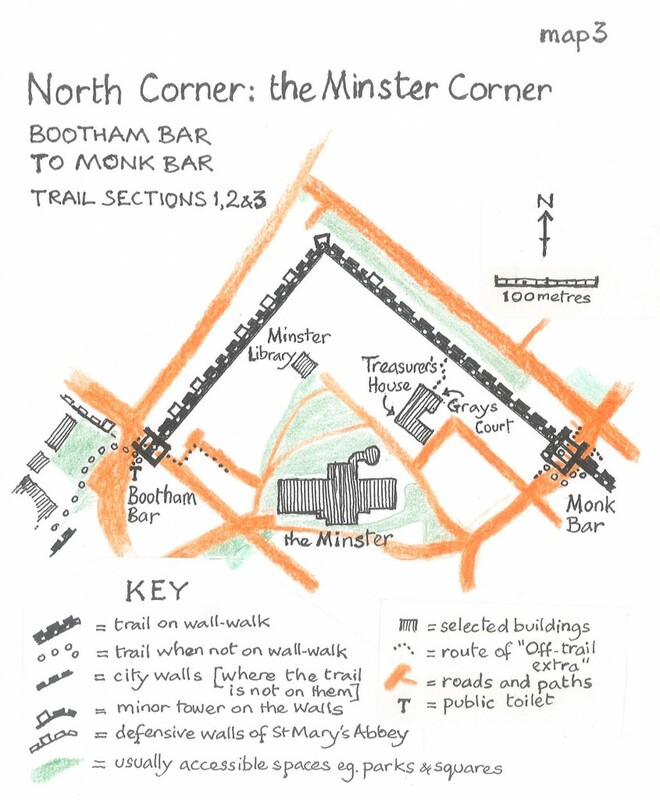 The toilets at Bootham Bar are newly re-opened [after upgrading, and installation of a mechanism to charge 40p ]. Their entrance is just to the right of the steps as you see them from the street. The court is a lovely, quiet street of Georgian housing 50 metres from the bar; if you go another 50 metres down it you get a splendid progressive view of the west front of the Minster [but you may then be tempted away from the trail along the Walls]. To get to the court, walk under the main arch of the bar [watch out for traffic and look up to see the spikes of the portcullis and perhaps notice the coarse sandstone of the outer archway, put up 900 years ago and scraped by traffic ever since], go 20 metres down Petergate into York then go up a passage to your left just before the modern but Georgian-style “Hole in the Wall” pub. Then you can enjoy the sight of the real Georgian houses at the end of this passage. 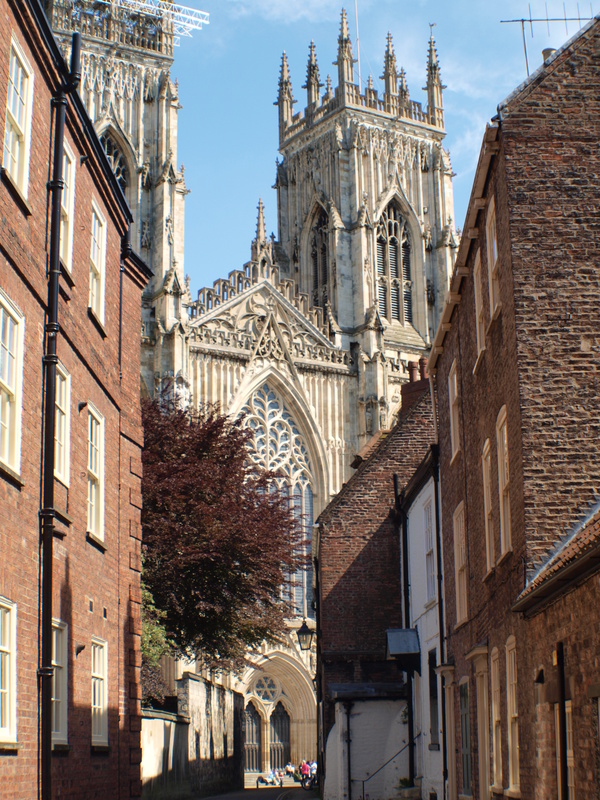 The west end of the Minster appears if you go down this quiet street. A precentor is in charge of music in a cathedral. An attractive independent café was neatly inserted beside the bar in 2015. It has entrances either side of the steps going up to the bar. Croque-Monsieur has a glass window in its floor, through this you can see part of the Roman fortress wall, just where archaeologists found it during the refurbishments. If you just want to look – the owner-manager, very reasonably, would prefer you to avoid visiting at busy lunchtimes -unless you plan to be a customer and buy a drink or some food. 700 years ago Scotland was fighting its war of independence against England. At this time York sometimes seemed like the capital city of England: parliaments met here, the treasury was kept here and the King and Queen were often here. 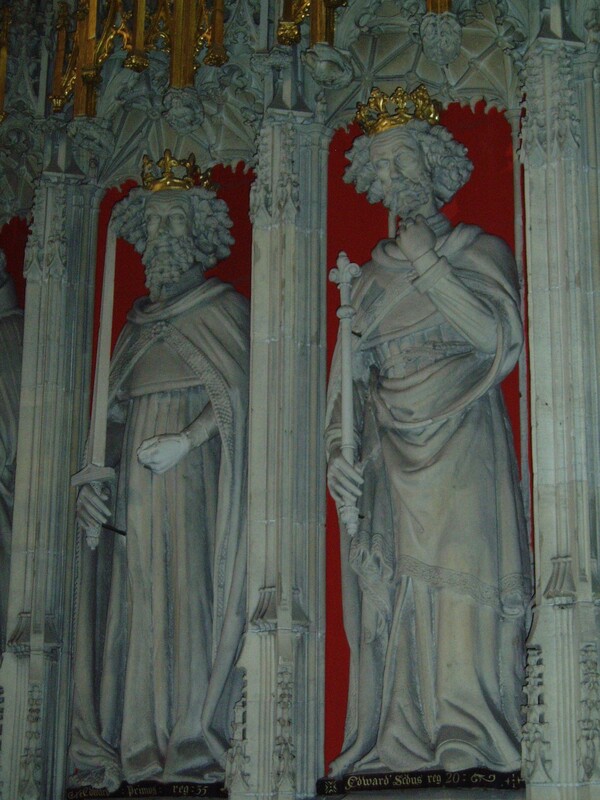 Edward II was King of England and he was particularly unsuccessful in war [his statue in the Minster shows him examining his finger nails, while his father stands beside him with his sword erect]. In 1319 events started to look a little like a game of chess: King Edward was besieging the Scots King on the Scottish border when a Scots force led by “Black Douglas” moved south to York in an attempt to capture the English Queen. 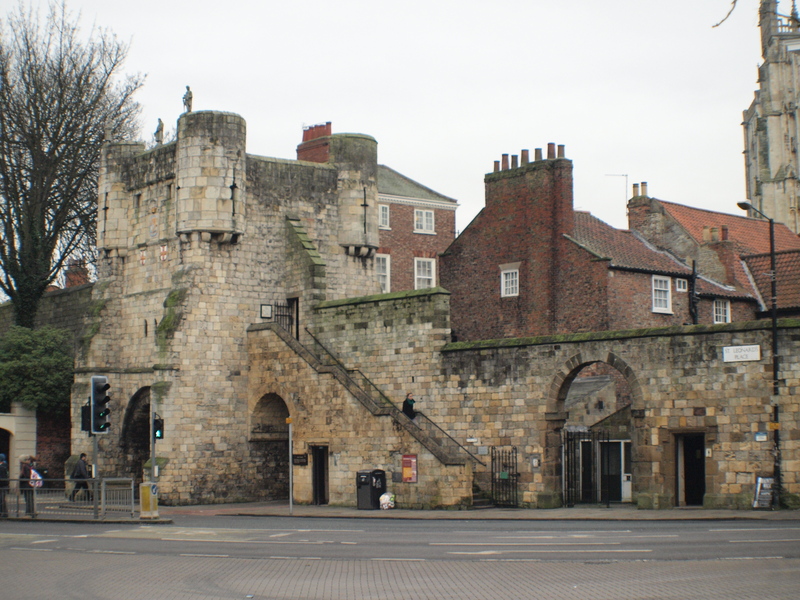 They got to the gates of Bootham Bar, and burned the houses outside it but they turned back when they discovered that the Queen had gone further south. The archbishop of York then chased after the Scots with the Lord Mayor and a force of priests and townspeople. 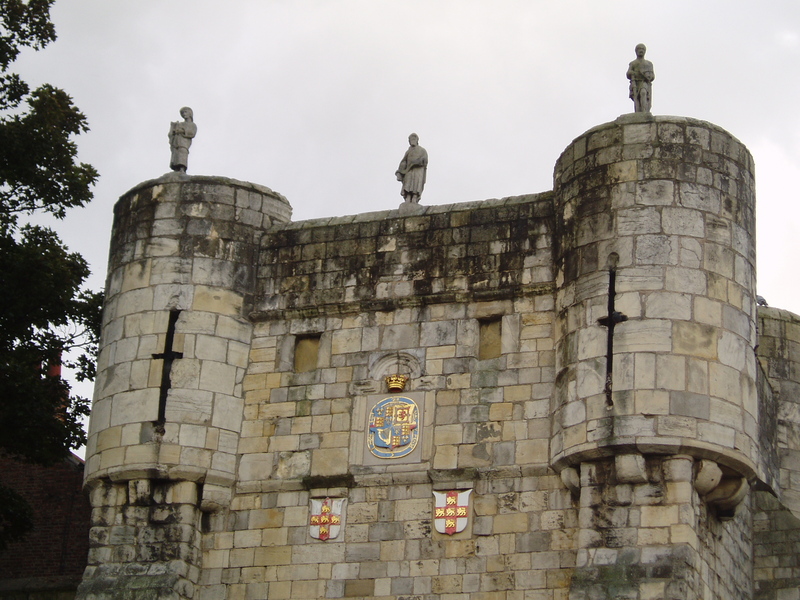 The York “army” were unwise to leave the protection of the Walls, they were heavily defeated by the Scots at the battle of Myton on Swale, the Lord Mayor and 3,000 English were killed. 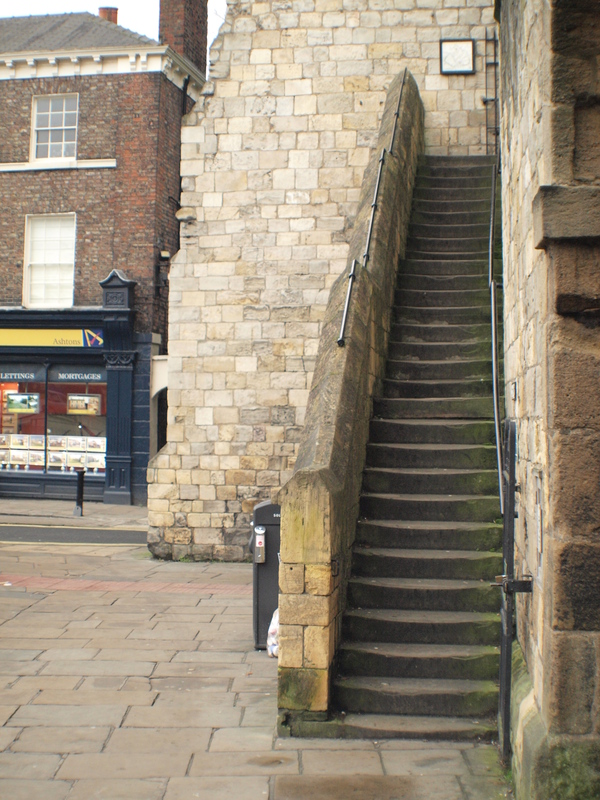 Immediately after this York started to strengthen its city walls, the last bits of wood walling were replaced by stone and barbicans were added at the front of the bars. Almost 200 years later Scots were still seen as a problem in York, the corporation ordered a “hammer” for the gate at every bar –any Scot wishing to enter the city was meant to knock with this to get special permission before coming through the bar. In 1503 Princess Margaret, daughter of King Henry VII of England, was leaving York for Scotland and her marriage to King James IV of Scotland. She was escorted through Bootham Bar and then down Bootham by the most important local officials. They were meant to be offering her their respect and protection but it seems they were more concerned with jockeying for position, competing with each other. It is recorded that the sheriff of Yorkshire [appointed by the King to have authority in the county] acted as if he had left the city once he had left the Walls behind him. To be precise he raised his staff of office upright and higher than the staff of the sheriff of York [who was appointed by city leaders, thanks to a royal charter of 1396]. 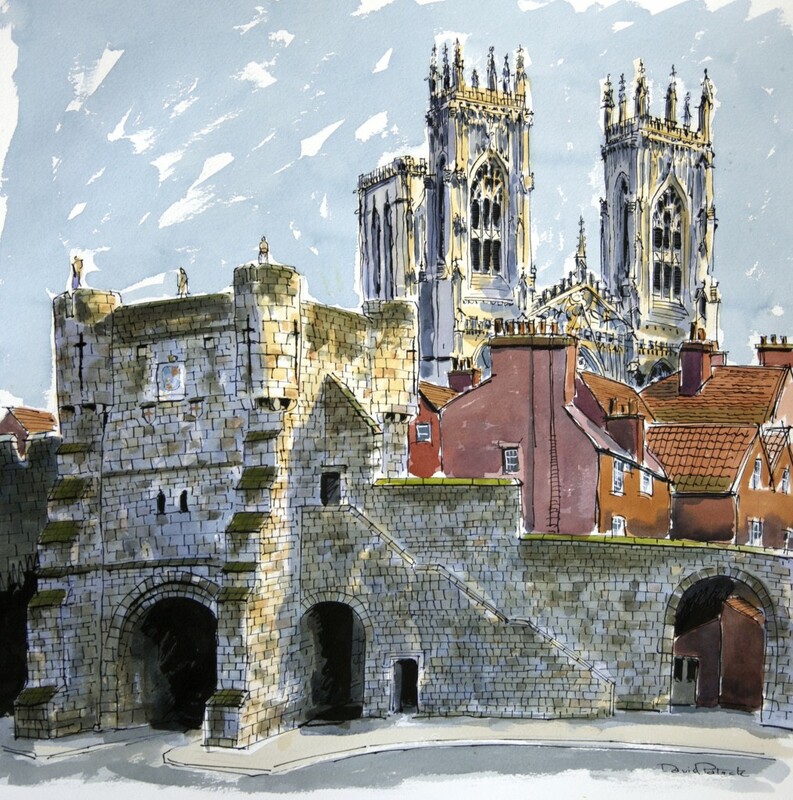 This disgusted the sheriff of York because the city of York stretched further than the obvious, defensible boundaries of the city –so his official authority stretched further than the obvious, defensible boundaries. Inside the city its sheriff had the legal power and he demanded that he should be allowed to show this by holding his staff higher. He complained to the Lord Mayor who told the sheriff of Yorkshire that the city continued to the Burton Stone about 400 metres away. So the sheriff of Yorkshire was compelled to lower his staff to the horizontal, along the side of his horse –until the boundary stone was reached and at this point the sheriff of Yorkshire raised his staff again and insisted that the sheriff of York’s staff was lowered for the next part of Princess Margaret’s journey. 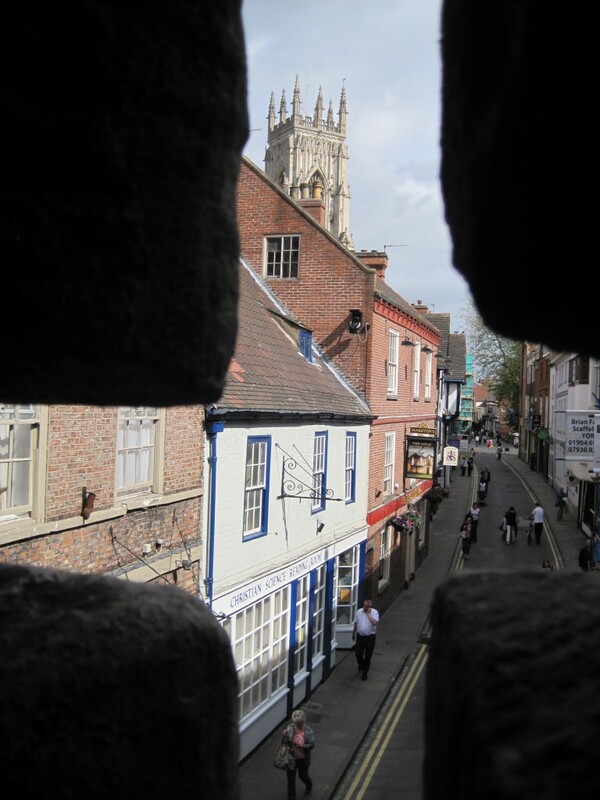 Some people think that the Walls, like the sheriffs’ staffs, came to be more about city pride than defence; this pride was linked to a sort of civic advertising, the Walls and bars made the statement “York is a wealthy and well organised city, where it is worth doing business”.